Laforge Doors is a garage door manufacturer known around the world for quality residential, commercial and industrial garage doors. Laforge's doors are built to withstand the extremes of a Nordic climate. Our hardware is made to withstand every possible need. 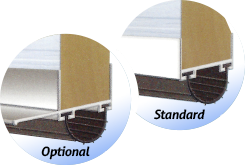 Laforge doors are engineered with a 1-3/4" core of polyurethane insulation that provides up to an R16 value throughout each panel. The core is permanently bonded to the twin outer face sheets with a unique high pressure, heat bonding process. The Standard door is a top of the line for steel model designed to be both energy efficient and low-maintenance. Owners will be delighted by the longevity, durability, and smooth operation that come naturally to a door built with the highest of standards.